One of the most beautiful features of the Stadium Theatre is the magnificent Wurlitzer Organ. An original installation when the theatre opened, the Wurlitzer has entertained Vaudeville and Movie audiences since 1926. Though the organ needs renovation, it can still be played. 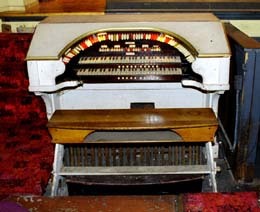 The Stadium Theatre Foundation hopes to fully restore the organ in the future. As soon as possible, we will post pictures and more information about this part of our restoration project.